The field of redox is rapidly changing, specifically in relation to plants where redox reactions are exacerbated compared to non-photosynthetic organisms. The development of proteomics has allowed the identification of hundreds of molecular targets of these systems, and the recent discovery of glutaredoxin's ability to bind iron sulfur centers (ISCs) and to participate in ISC assembly in other apoproteins has provided many new insights. This volume presents new research on oxidative stress in plants, ranging from the production of reactive oxygen species or reactive nitrogen species, to their accumulation, their involvement in signal transduction, and their degradation, while also covering the links among oxidative stress and biotic and abiotic stresses. 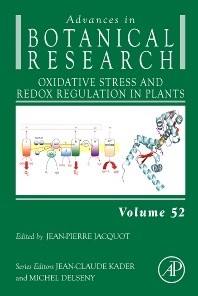 Professor Jacquot has contributed to the elucidation of redox regulation in plants. Study of the thioredoxin and glutaredoxin systems and their molecular targets. His technical competence includes: plant biochemistry, genetic engineering, site directed mutagenesis, protein structure function relationship. He has 230 articles published in peer reviewed international journals. 180 accessible in Pubmed, 228 in ISI web. He has also been the Series Editor for Advances in Botanical Research (Elsevier) since 2011 and Editorial Board member of The Journal of Biological Chemistry from 2008-2013. He has been a senior member of Institut Universitaire de France since 2007 and received Gay-Lussac von Humboldt Prize Bundes Republik Deutschland Académie des sciences française, mention Biology 2009-2010. His past and present administrative duties include Member of Conseil National des Universités section 66 (2005-2007and 2011-today), Director of Structure Fédérative 4242 Ecosystèmes forestiers, Agroressources, Bioprocédés et Alimentation (EFABA) (since 2004), Director of Pôle de recherches A2F (Agronomie Agroalimentaire Forêt), Université de Lorraine (2006-2011, 2012-today) and Head of the group «Stress response and redox regulation » of UMR Interactions Arbres Microorganismes till 2012.